SECONDARY MARKETS May 2017 • SHOPPING CENTER BUSINESS • 327 I magine a retail center that draws from a 150-mile radius, where consumers stay for hours and buy for the en- tire family. Sound like a dream from the 1960s? Or science fiction? It's not. Starwood Retail Partners' Rimrock Mall in Billings, Montana, is a tourist attraction in its own right, serving a four-state trade area. It routinely sees shoppers driving hours to spend a day or more shopping, dining and being en- tertained. While developers, investors, retailers and media have been busy focus- ing on high-end centers in gateway cities such as New York, Chicago and Los An- geles and their suburbs, dominant centers in secondary cities also are doing well if properly leased. And demographic trends support that many of these markets are poised for significant growth. Starwood Retail Partners owns and operates properties in such top MSAs as Chicago, Dallas, greater Los Angeles, San Francisco and Atlanta. We know that the density of these markets attracts top ten- ants, and keeps our centers busy day and night. But there is just as much opportuni- ty in our projects in smaller cities includ- ing San Diego, Charlotte, North Carolina, and Denver. Increasingly, analysts, inves- tors and now retailers are agreeing. Why? Largely because of the millen- nial generation, who want an urban life- style, where they can walk to work, din- ing and entertainment just as many do in New York and Chicago, but without the high costs of those cities. It's not a coin- cidence that many secondary cities are located near the gateways, and that to at- tract these young workers, developers are creating, or redeveloping more urbanized projects in them. We at Starwood are re- developing The Shops at Willow Bend in Plano, Texas, near Dallas, into a multi-use commercial core. 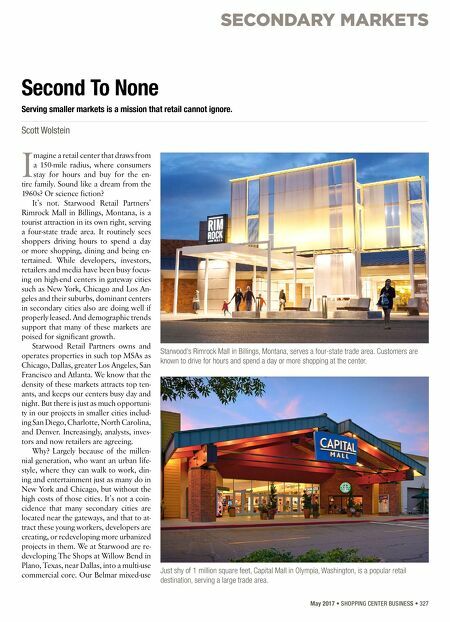 Our Belmar mixed-use Second To None Serving smaller markets is a mission that retail cannot ignore. Scott Wolstein Starwood's Rimrock Mall in Billings, Montana, serves a four-state trade area. Customers are known to drive for hours and spend a day or more shopping at the center. Just shy of 1 million square feet, Capital Mall in Olympia, Washington, is a popular retail destination, serving a large trade area.